They endured beatings, bombings, harassment and imprisonment—but they changed the Civil Rights Movement and demonstrated the power of individual actions to transform the nation. In 1961, Civil Rights activists organized by the Congress of Racial Equality rode interstate buses deep into the heart of segregated America to challenge local laws and customs that denied ordinary citizens basic freedoms because of the color of their skin. 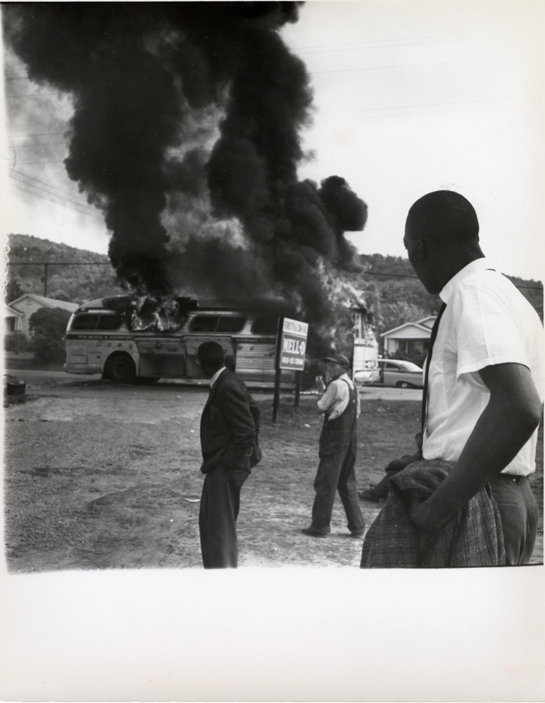 The 1960 Supreme Court Decision Boynton v. Virginia granted them the legal right to buy tickets for buses and sit where they’d like, but all were aware they would face violence and vitriol in the fight to end white supremacy. 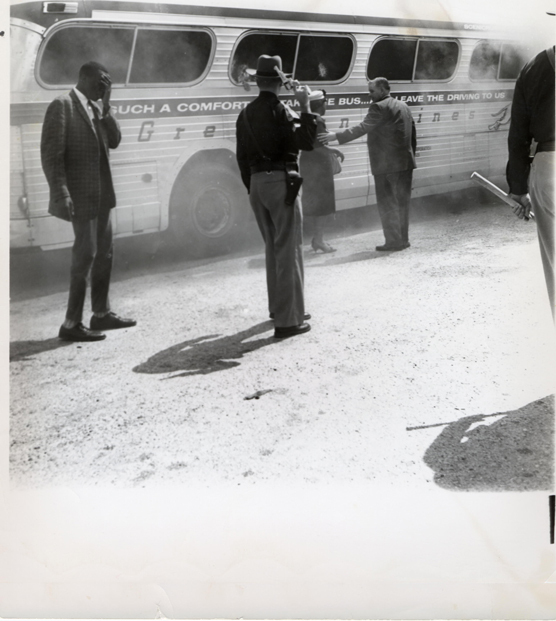 One Sunday afternoon May 21, 1961, 13 ‘Freedom Riders’ boarded a Greyhound Bus in Washington D.C. for their inaugural mission to protest segregated busing practices in Southern states. On the way to Birmingham they were stopped just outside Anniston by a mob of angry white men. 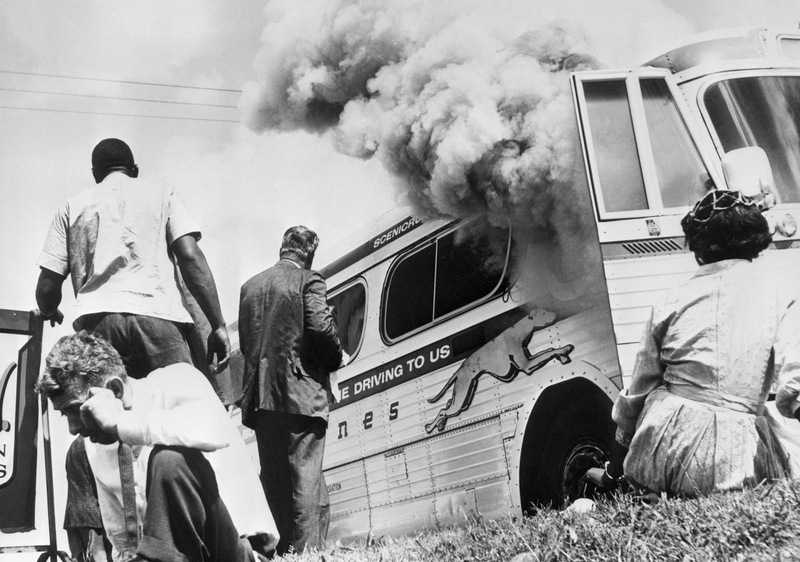 Enraged by the Freedom Riders’ mission, they proceeded to attack the bus with pipes and boards, breaking windows and slashing tires. The driver managed to steer them free, but the bus was chased by a convoy of cars; driving on rims, he bailed in front of Forsyth & Son Grocery to flee on foot. Surrounding the bus, the mob held the doors closed and threw an incendiary device through a broken window, filling the bus full of smoke. An explosion inside forced them to back off, giving the passengers inside a chance to escape, but they were met with slurs and fists as soon as they fled. Watching it all from her front doorstep was 12-year-old Janie Forsyth McKinney ’70. But McKinney, in what she describes now as an out-of-body experience, reacted. 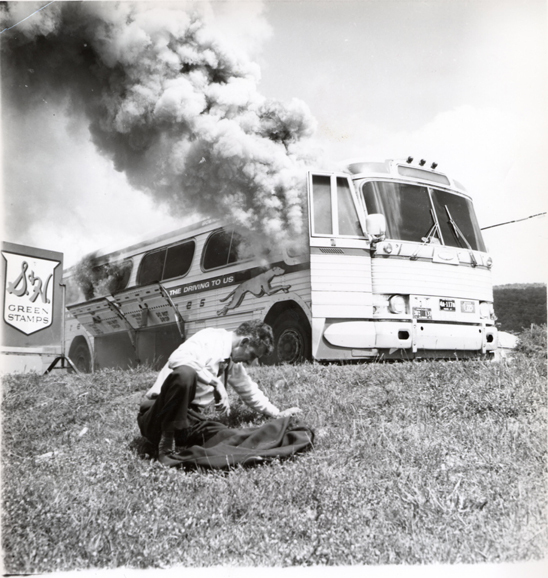 Grabbing a bucket from inside her house, she took water and cups to badly burned Freedom Riders caught in the middle of the fray, still choking on smoke. Her trance-like state was a blessing in disguise–the bucket was too heavy to carry completely full and she needed to make a lot of trips to the faucet. Though she considered her actions small and insignificant at the time, in the decades since McKinney’s story has become legend, a ray of hope in the middle of one of the darkest moments in American history. In Anniston, where the Ku Klux Klan was a constant presence, McKinney’s actions did not go unnoticed. Klan members of the community met in secret to discuss how or if she should be punished. Sticking up for McKinney, a neighbor supposedly said “I don’t see where she did anything so wrong; hell, you’d give a dog water,” which she believes ultimately spared her. Life was never the same for Janie McKinney in Anniston after that. Though people seldom discussed what happened that day, hostility was still a constant factor, particularly in high school where the children of community Klansmen often confronted her in the hallway. Later, in her homeroom class, McKinney noticed that students were crying over toxic grades in English class that would derail their dreams of attending college. “I said, ‘Class, if you got a lower grade from Mr. J____ than you think you deserve, please raise your hand.’ A whole bunch of hands went up. I said, ‘You have a legal right to make Mr. J____ tell you how he arrived at your grade. He has to show you, it’s his legal obligation. And I want all of you to go down there together so there will be plenty of witnesses if he tries anything,’ and they did. It was glorious,” she says now, laughing.